Beautiful yellow flowers grow wild throughout the Gorges du Verdon in the Parc Naturel Regional Du Verdon in the Provence, France in Europe. 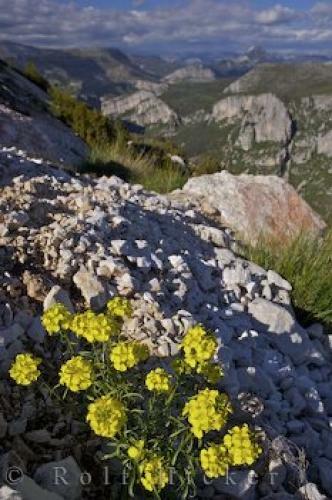 Wild flowers appear in the most obscure places in the Gorges du Verdon in the Provence, France in Europe. Varieties of flowers bloom in the rock edges throughout the Gorges du Verdon in France which makes this canyon even more colorful and scenic than it already is. A yellow flowering plant on the rim of the Grand Canyon du Verdon, Gorges du Verdon, Verdon River, Parc Naturel Regional du Verdon, Alpes de Haute, Provence, France, Europe. Gorges du Verdon in France, Europe.